How do you convince someone to give you a chance when they’ve never met you? Ask for an introduction email. Fact: Nine out of 10 people trust recommendations from others they know. Connecting through a mutual acquaintance can be the difference between a cold email and a warm welcome. Even better, with the right introduction email template, you save time writing but still show that you put in the extra effort. 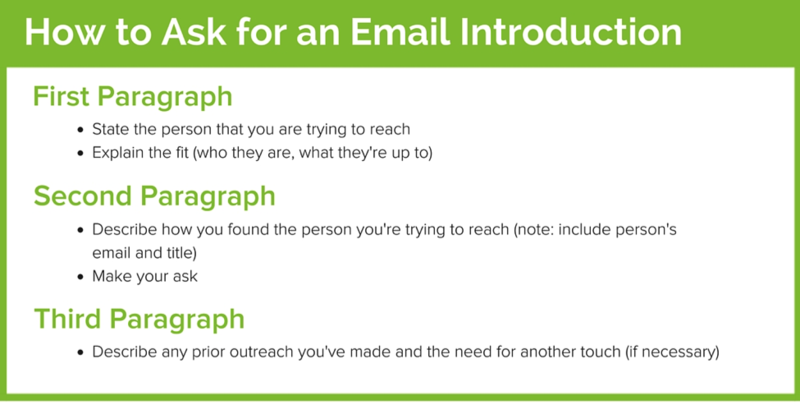 Here are three types of introduction emails you can start writing today to land more clients, book more meetings, and grow your career. Know you’re sending your emails at the right time with this free tool. Tight on time? Jump around to any section. Tight on time? Here’s a doc with all 3 templates — for easy copying. A poorly written introduction request reads like a shoddy instruction manual. The bottom line: It pays to draft an email they can easily forward on your behalf. The bulk of the content should be written directly to the person you’d like to meet as if they were reading it as-is. Evidence that you’ve done your research. Seeing this makes people more motivated to help you. A clear reason why your target person would benefit from the intro. Satisfying our own self-interests is pretty darn appealing (just how our brains work). A succinct message that closes with a clear call to action. Roughly half of email replies are less than 43 words. With all the boxes checked, she made it super easy for Mark to go ahead and forward her request along to Chad — less than 20 minutes later. Save your intro request as a customizable template that lives in your inbox. So what happens when you’re on the receiving end of an introduction request? We recommend keeping it courteous with the double-opt in method. Fred Wilson popularized this networking approach as a helpful reminder to be respectful of people’s time. The idea is to ask permission from both parties before green-lighting unsolicited introductions, giving either person a chance to decline if they so choose. First ask the requestor to write you an intro email you can forward along to your contact (if they haven’t already). Add a personal note up top — compliments are persuasive, remember? Real world use-case: Here’s how our former VP of Sales used this method to let someone opt-in to an email introduction requested by one of our sales reps. It offers clear and compelling reasons why Marsha could benefit from accepting the offer, but only “if possible” and on her terms. Perfect the double opt-in with this simple, reusable template. Use LinkedIn to determine who your prospect’s boss is. Send a cold email to that Director/VP/CEO level person asking who manages the initiative you’re interested in discussing. They (hopefully) point you in the direction of who you want to reach. You reference their referral in an email introducing yourself to your prospect, or forward the original email inquiry along with the boss on CC. Not only does this get you an introduction from someone inside that person’s company, it’s coming from their boss — which makes it much more likely that they’ll reply. That’s because we’re naturally conditioned to follow the lead of authority figures. 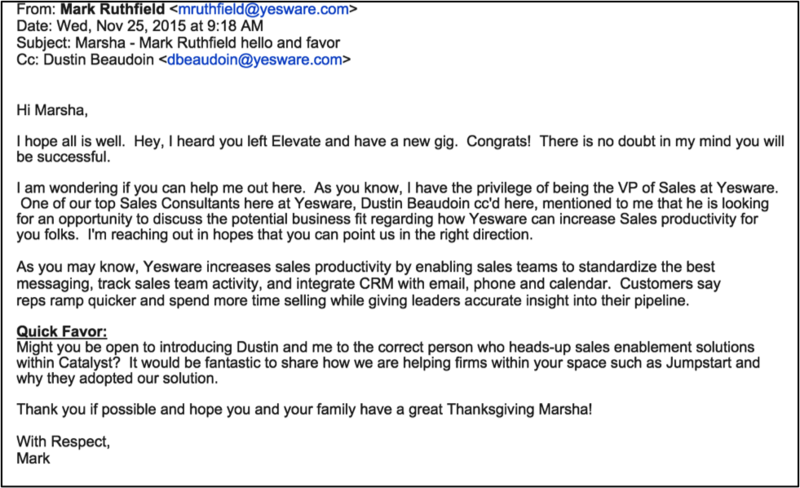 Real world use-case: Here’s a great email introduction sample from Yesware’s CEO that shows what happened when someone (real name changed) asked to connect with a member of our marketing team. Boom. Intro made. (Although note that we are an email-focused company — other CEOs might not be so responsive 😉 ). Here’s the introduction email template you can steal in seconds. Product Marketing Manager at Yesware.